"Your team is awesome! The attentiveness of your office, delivery and service personnel are second to none. A few days ago I phoned Charlie Brown at 8am to tell him our gas water heater had failed and required replacement. From the golf course at noon I checked in with my wife to see if she had heard from you guys. "Heard from? ", she replies "the job is finished!" Then I get the bill and the water heater (installed by the builder) was under warranty. You charged me $156.00 for two connectors and labor. Don't worry about referrals from me!" Proulx Oil & Propane offers a wide variety of water heaters for residential use from both Bradford White and Rinnai. Bradford White water heaters are available in configurations for nearly every residential application. They are offered with fuel sources including propane gas, electric, and oil. Indirectly powered water heaters that use the heat for a boiler to heat potable water are also part of the residential line. Bradford White offers multiple styles to suit your specific needs including atmospheric vent, power-direct vent, power vent, direct vent, point-of-use, storage, and tankless models. 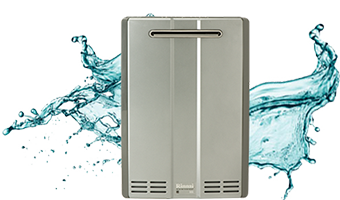 Enjoy fresh, hot water at your fingertips with a Rinnai Tankless Water Heater. Delivering an endless supply of hot water whenever you need it, you can shower, wash dishes, and do laundry at the same time without running out. Tankless Water Heaters revolutionize comfort, energy efficiency and convenience. Install a New Propane Water Heater as low as $100 under our cost! Replace your electric water heater or change from oil, and you may qualify for an additional $300 rebate. You will get a NEW propane water heater installed for $100 under our cost!